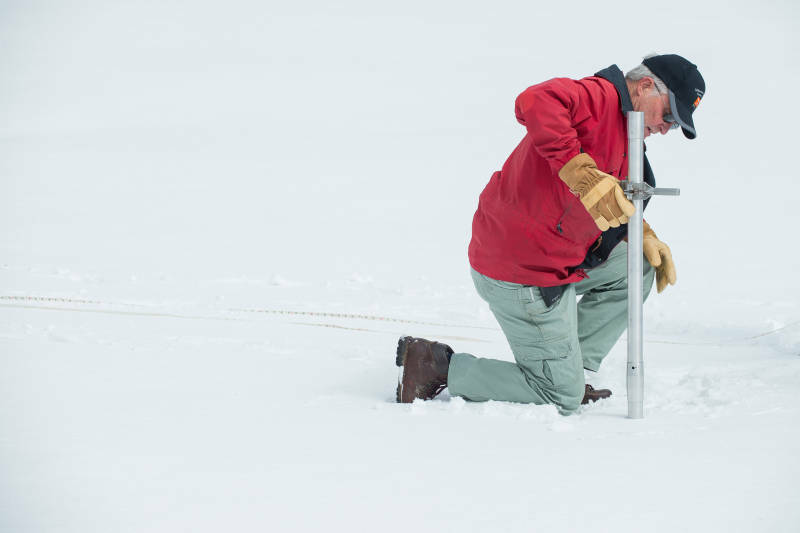 The "April 1" snow survey in the Sierra Nevada is always anxiously awaited, in the truest sense of the term. Early April is when the snowpack is generally reckoned to have peaked and the spring melt season is upon us. If there isn't sufficient snow by now to carry California through its parched summer, there likely won't be. This year's April1 survey (done on March 30 this year for arcane reasons) was a good news/bad news affair. The good news is that water content (which is what they actually measure, not accumulation) came in at 87 percent of average -- that's a far cry from last year at this time, when Governor Jerry Brown stood on a barren mountainside along Highway 50 to announce California's first-ever statewide mandatory water restrictions. The snowpack on that date was virtually non-existent, shattering records for "bad" at about 5 percent of normal. The bad news is that same 87 percent of average, which is to put it another way, 13 percent below normal. After four years of drought, hydrologists have warned, that's not going to cut it. It's hard for many to square the ongoing drought with reservoirs that have filled rapidly in recent weeks, water tumbling down huge spillways in many cases (often a required precaution against possible floods). California has been under a declared state of drought emergency since January of 2014, and water use restrictions have been extended through the coming summer, with some yet-to-be-announced modifications. Meanwhile, state water managers urge that, "Residents should continue to conserve water due to drought conditions and impacts that are still felt in many parts of the state." Spring blizzards are not unheard of. The survey comes just two days after Reno recorded it's third biggest dumping of late-season snow on record -- nearly 7 inches. But once the calendar turns to April, precipitation of all kinds drops off dramatically throughout California and the Sierra.